Our made-from-scratch “wigglers” are made with all natural ingredients and no bright, neon artificial colors at all. SPECIAL OFFER: SchoolFamily.com readers can purchase No Whine With Dinner at 30 percent off the list price, and get free shipping, by ordering the book here and using this promo code: FS2011. In a blender, blend together 1 cup of juice and the frozen fruit until smooth. Pour into a small saucepan and bring to a boil. Stir occasionally to break up any frothy bubbles. Meanwhile, place the remaining 1/2 cup juice in a large bowl. Sprinkle the gelatin over the juice and let stand 1 minute. Add the hot juice mixture and stir, or gently whisk, until the gelatin completely dissolves, about 5 minutes. Stir in the sugar. Pour the mixture into an 8 x 8-inch pan or dish. Refrigerate until firm, about 3 hours. 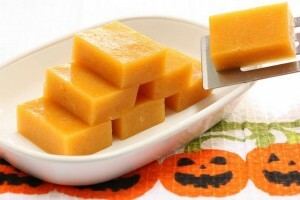 Cut into 24, 2 x 1 1/3-inch rectangles (use an off-set spatula to remove them from the pan).